A UNIT nuclear convoy, stranded on the shores of Lake Vortigern, becomes the focus of an incursion by knights from a parallel reality. Close to the lake, the sinister Mordred battles against his enemy Ancelyn and summons his mother, the powerful witch Morgaine. 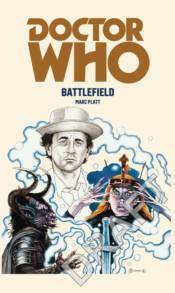 The Seventh Doctor and Ace find themselves working alongside Brigadier Lethbridge-Stewart, brought out of retirement to deal with the crisis, as well as unit's new commanding officer Brigadier Winifred Bambera and the knight Ancelyn. Is the Doctor really Merlin? This novel is based on a Doctor Who story which was originally broadcast from 6-27 September 1989. This title features the seventh Doctor as played by Sylvester McCoy with his companion Ace.